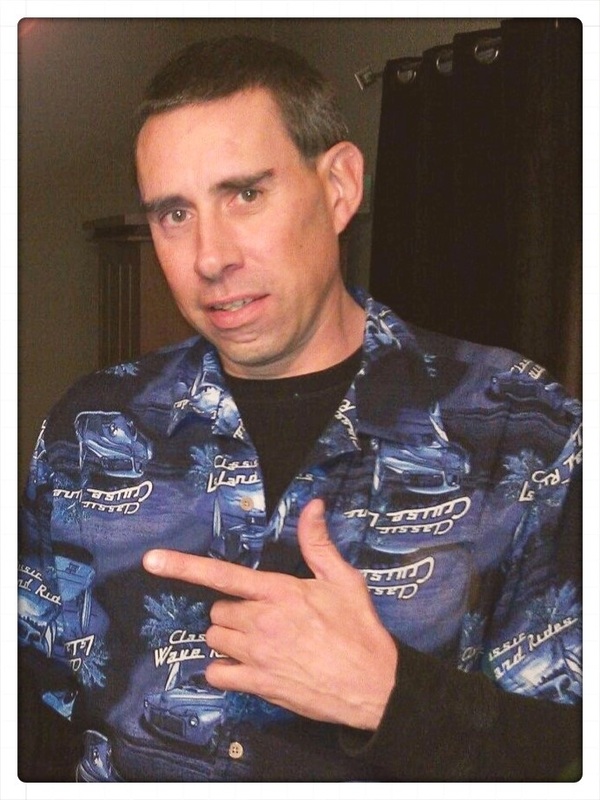 Service Location: Bunker's University Chapel, 3529 E. University Dr.
Robert Earl Goldman, 48, passed away peacefully on his own accord and without pain on Monday, March 16th, 2015 at 3:06 p.m. Arizona Time while in the generous care of the ICU medical staff at Banner Gateway Medical Center in Gilbert, Arizona. Robert waged a nearly 3 year battle with medullary thyroid cancer, and fought an impressive battle against an original expectancy of only 6 months. Robert was born on April 14th, 1966 in Philadelphia, Pennsylvania. He graduated from North East High School, North East, Maryland in 1984. He enjoyed residence in Baltimore, Maryland for a time, moving to Newark, Delaware where he spent nearly 8 years working as the head of Materials Management at a State Hospital before moving to Mesa, Arizona in August 2010. He spent his last years working as a Warehouse Manager for Premier Moving and Storage. He is survived by his parents, Harry and Dorothy Goldman of Bear, Delaware; his daughter, Nicole Antonette Goldman and granddaughter Vivian Ann Izabella Blomquist of Newark, Delaware; step-daughter, Jennifer Hodgson and step-granddaughter Annabel Trinity Hodgson of Smyrna, Delaware; his sister, Dee Goldman-MacKenzie with niece Gabriella Eve MacKenzie and nephew Zachery Charles MacKenzie of Elkton, Maryland; his brother, Harry Goldman and wife Catherine with nieces Lauren Angelica Goldman and Terri Lyn Goldman, and nephew Seth Pierce Goldman of San Tan Valley, Arizona; and Robert’s extended family including dozens of Aunts and Uncles, with hundreds of 1st and 2nd cousins who were all touched by his presence over the years. He is preceded in death by his grandparents Dot & Earl Martin of Elkton, Maryland – and Morris and Rose Goldman of Philadelphia, Pennsylvania. Services are to be held from 6:00 – 8:00 pm on Friday, March 20th, 2015 at Bunker’s University Chapel, 3529 E. University Dr., Mesa, AZ 85213. Friends and family are welcome to pay their respects at this time. Robert wished to be cremated and following his wishes, he will have services both here in Mesa, Arizona and in Stanton, Delaware following the cremation. In honor of his love for nature and the outdoors, his remains will be used for the planting of a tree in his honor here in Arizona. Contributions to the family in his memory may be directed to a GoFundMe account created in his name, or by contacting the funeral home for more information. Bobby was a huge blessing in my life. We met on the internet and started sharing our daily lives and our personal histories in June of 2013. We were amazed at how similar we were in character although we are product of entirely different backgrounds. While discussing his health one day I expressed a wish to meet him in person before he passed on. He said he wished for the same thing. I have MS and because of an Anxiety/Panic disorder I isolate myself in my home, my comfort zone. This has made me Agoraphobic, I am afraid to leave my home, so I have a Service Dog named Panda. It took us from his birthday in April of 2014, when he invited me to come stay with him, until September for me to prepare and build the courage to leave my safety zone. Bobby changed my life by inviting Panda and Me into his home and into his life. I was welcomed and accepted in warmth by his family in Arizona, Harry, Cat, and kids as well as Cat’ parents, and also by his friends in his apartment complex. I spent almost six weeks in Mesa with Bobby and cherished every moment, I was blessed to know him, his love for me changed my life. Since returning home in October 2014 we kept our special friendship alive and I missed him so much. In his last month he sent me long text messages of how he was feeling and let me know how much I meant to him. Oh how I wanted to be there but Bobby said we got our wish. I will keep my promise to love him forever simply because he loved me first. I never felt so special in my entire life as I did with him in Mesa. Harry and Cat, your family treated me with open acceptance, my own family has deserted me, so it was great to feel like I had a family to belong to. My time with Bobby and his love for me was my life long dream come true. I love you forever Bobby and miss you forever too. Vaya con Dios mi Corazone. My deep heartfelt condolences to his whole family for your loss, he was an extraordinary man, a man of integrity, compassion, and love. Harry, Dot, Dee and entire Goldman family. I am so sorry for the loss of your son. Please know my thoughts and heartfelt prayers are with you all at this very hard time. My memories of Bobby are from childhood. We did so many things back then that were dangerous, like walking across a trestle or jumping “the falls” of Cobbs Creek. Someone always seemed to be daring somebody else to do something crazy. Somehow we got through our rough and tumble childhood where we ran free on the streets of Colwyn & Darby or rode our bikes with the banana seats until the street lights came on. We all seem to have left the old neighborhood. My mind goes back to a simpler time when the summer days were long & a couple of skinny kids with cutoff jeans, tube socks & converse sneakers were on the loose… just looking for something to do. This was what it was like where we grew up. And this is how I remember Bobby. Blessings to his family and i will see you on the other side my friend !!!!!! I am very sorry foe your loss. May the words found in Philippians 4 : 6,7 bring you comfort. Oh my dearest Rob! Where do I begin? There are no words to express my love for you since the day we met and my deepest sympathies for your entire family right now. You and I fell in love at school in 1987. Seems like yesterday. You took me camping in the woods, wheelchair potty and all! 🙂 Opened my eyes to nature I grew up with but had not seen since my accident in 1986. We became kindred spirits with our spats at one another. Panda sat neatly in the window of our apt. while “Buns” the angora rabbit had free run of the house! We used to have to tie her ears back with little pink ribbons to keep them out of her food and water dish. Who would have thunk that a rabbit could be house trained?!? Buns was the best! We shared so many good times together whether at the apt, with my cousin and sister always visiting or up at your parent’s house with the corgi twins! Such sweet dogs! Dee always on the loose and HT a bit young at the time but was always Rob’s sidekick. Both HT and Dee looked up to Rob as their “Fugly” brother! He will always be know for “Fugly” Time went on and a few years later we parted ways only to be friended again by this guy named Robert Goldman on Facebook! For the love of the internet! We spent hours, days and weeks reminiscing about the days gone by, old friends like Jerome and the days we spent with AJ. Who knew what different life paths those two would take. Both became great men in their own separate ways. I was very fortunate to have seen him again in person when he came to stay for a few days in 2013. Days I will always cherish. Late night phone calls, emails on Facebook and such great laughter! Oh Rob, if I could only spend one more day with you in deep conversation. You left us too soon but, you will always hold a special place in my heart.